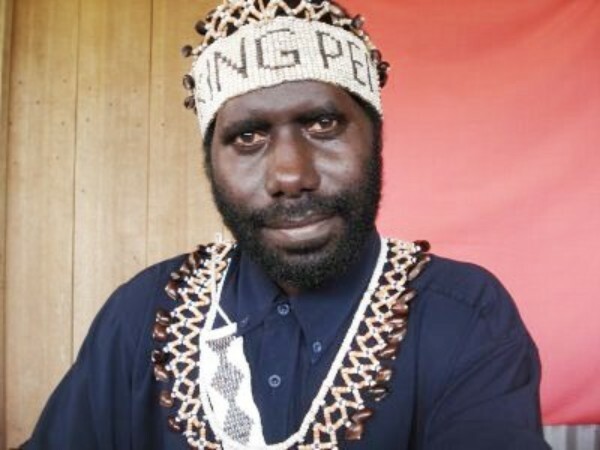 Governor of the Bank of PNG Loi Bakani has advised the public not to accept or conduct any transactions using a currency called “Bougainville Kina”. It is illegal. 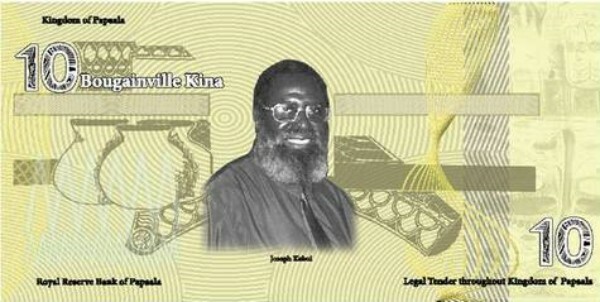 In a public notice today, Mr. Bakani said the currency “Bougainville Kina” was introduced by a Noah Musingku, through the dealings of U-Vistract and is not recognised by the Bank of PNG. Under Section 59 of the Central Bank Act 2000, the Bank of PNG is the only authorized institution mandated to issue PNG currency Notes and Coins in the country. Bougainville Kina cannot be used as it is not legal tender in Papua New Guinea. Eine zunehmende Anzahl von Anfragen erreicht die ESBC seit Ende 2011. Alle beziehen sich auf einen sogenannten Bougainville Kina. Um es klar zu sagen: Der Bougainville Kina ist das Fantasieprodukt eines Gauners namens Noah Musingku, der sich in den Wäldern Süd Bougainvilles mit einigen Getreuen versteckt hält. Musingku, der sich auch gerne King Pei II nennt, hat mit einem Schneeballsytem namens U-Vistract viele Menschen um ihr Erspartes gebracht. Unterstützt wird Musingku von oskuren Zeitgenossen in den U.S.A. die zum Beispiel seinen Webauftritt www.ibom.biz hosten. Er hat es sogar fertig gebracht, eigene Bougainville Kina drucken zu lassen, die allerdings noch nicht einmal das Papier wert sind, auf dem sie gedruckt werden. Die ESBC raten dringend, sich auf keine Geschäfte mit IBOM oder anderen einzulassen, bei denen Ihnen Geschäfte in Bougainville Kina angeboten werden. Sie werden Ihr gutes Geld mit Sicherheit verlieren! Informieren Sie bitte umgehend das zuständige Betrugsdezernat Ihrer zuständigen Kriminalpolizei. Klicken Sie bitte hier, um mehr über Musingkus kriminelle Machenschaften zu erfahren! The ESBC is highly alerted by increasing activities to promote the fake currency "Bougainville Kina" on international financial markets. On May 2oth, 2012 we found this text below on the homepage: http://de.gbp.cer24.com/eur/?q=bougainville%20kina%20currency%20forex . Convert bougainville kina currency forex British Pound Euro, (GBP EUR) with the latest currency exchange rates is to use the currency pair known as GBP/EUR in the forex market for converting bougainville kina currency forex from GBP to EUR and converting from bougainville kina currency forex British Pound to Euro with our conversion calculator. In order to view the GBP to EUR rates, GBP to EUR chart, GBP in EUR graph and how much is bougainville kina currency forex British Pound in Euro rather than how much is bougainville kina currency forex GBP in EUR, please look for the links marked as GBP EUR Rate, GBP EUR Konverter, GBP EUR Chart And GBP EUR Geschichte in the calculator sections below. On top of that, tools for Selling GBP / Buying EUR and Selling British Pound / Buying Euro are also provided for you along with converting GBP to dollars, euros, pounds, rupees, yen and rmb. Are you looking for how much is bougainville kina currency forex Euro in British Pound (bougainville kina currency forex EUR in GBP)? Check out EUR GBP. The ESBC consider this information as fraudulent. We confirm our WARNING not to get in contact to these people.! The contact form links to a Chinese company with the domain name www.liaboc. PAPUA New Guinea authorities are holding an American man who tried to smuggle into Bougainville 1.6 million Bougainville kina from the United States on Saturday. American citizen Barry Keith Webb (pictured) flew in from Manila on Air Niugini flight PX 011, which arrived at 5am on Saturday with bookings to transit to Buka on Air Niguini flight PX 251 the same day. Airport authorities detained Mr Webb after going through his documents and baggage, which included a brief case full of newly printed Bougainville kina totalling 1.6 million. The airport authorities consis-ting Customs, Immigration, Natio-nal Airport Corporation and Air Niugini alerted responsible government authorities including police and the central bank, who interrogated the man, who claimd to be an executive of the International Organisation of Economic Development (IOED). The United States Embassy was also alerted and their officials were also present at the airport during the interrogation, which almost took four hours at the Jackson International Airport on Saturday morning. According to Mr Webb, he was travelling to Bougainville on an invitation from authorities in Bougainville, specifically from the Corner Pinati Avenue, King Square, Tonu City. He had in possession documents and a letter from those in Tonu, which he handed to Government authorities as proof. In one of the documents which the Post-Courier is in possession of, Tonu City leaders wrote to Webb in November 12, 2013 advising him that he had won a permanent position to represent the central bank of Bougainville as the minister for international monetary relations. The letter was signed by a King David Peii II (pictured) as the head of state, Sir Peter Lising as the governor of the Central Bank and Roger Renaud as the secretary of State on his permanent appointment with details of his job descriptions. 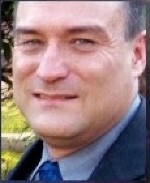 "As the Minister for International Monetary Relations for the Central Bank of Bougainville to represent the Central Bank of Bougainville for the purpose of developing relationships internationally with Central Banks of other sovereign nations and /or commercial banks and additionally for the purposes of developing corresponding accounts and facilitating exchange relationships for Bougainville’s Kina (BVK) with other currencies worldwide," they advised Webb. FULFILL any and all decrees issued under the authority of or by King David Peii II. But Bank of PNG Governor Loi Bakani told the Post-Courier last night that the money was illegal and that the central bank lawyers were looking at possible penalties and working on the charges to be laid today. "The money is illegal. 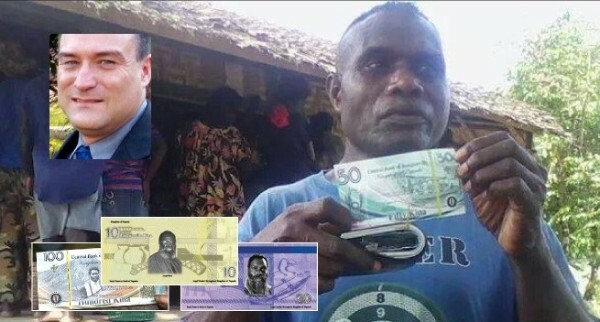 If you look at the 100 Bougainville kina note, it has the kina name on it but different features and pictures, therefore it is illegal," Mr Bakani said. "Also the legal tender is in Papua New Guinea kina and the change of the design also has its own penalties." Mr Bakani, who was also at the airport for the questioning, said the Bank Act was breached and he has instructed his lawyers to work on the charges to be laid on Mr Webb today, including other penalties. Customs Commissioner Ray Paul confirmed the incident but said he is waiting for full details from all government authorities before he could comment. He said the Customs office will hold a press conference today about the matter. Immigrations officials also told the Post-Courier last night that Mr Webb would face penalties but said they would rather have the police and other authorities announce the consequences he would face today. Police advised they will respond today when they all meet to determine the next course of action.